Rejuvenating, relaxing and restoring. Distilled from the freshly picked blossoms of the Bitter Orange tree, Neroli Essential Oil, with its beautiful sweet citrusy-floral aroma appeals to both women and men. In common with rose and jasmine, it is a complete fragrance in itself and forms the heart of one of the world’s most enduring perfumes, ‘Eau de Cologne’. Neroli is an exceptional skincare oil that encourages new cell growth and therefore especially valuable for use on dry or mature skin. When used as part of a regular skin care routine, it improves skins elasticity, stimulates skin cell renewal, reduces facial thread veins, softens scars and wrinkles, and smells absolutely divine. 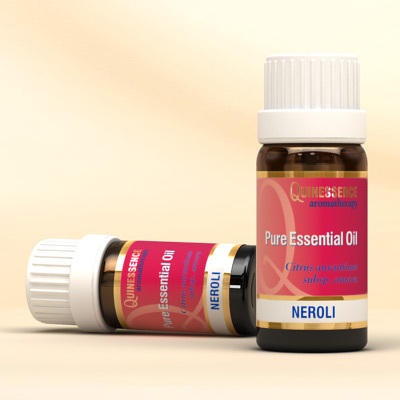 Virtually all types of skin problems respond positively to treatments that include Neroli Essential Oil, and it can be used in carrier oils or base creams and lotions. What more could you ask from an essential oil! This amazing oil is one of nature’s most effective antidepressant essential oils, which together with its balancing and sedative properties makes it perfect for treating all types of negative emotional conditions, states of anxiety, menopause, and insomnia. This action may also in part explain Neroli Essential Oil’s legendary reputation as a highly effective aphrodisiac.